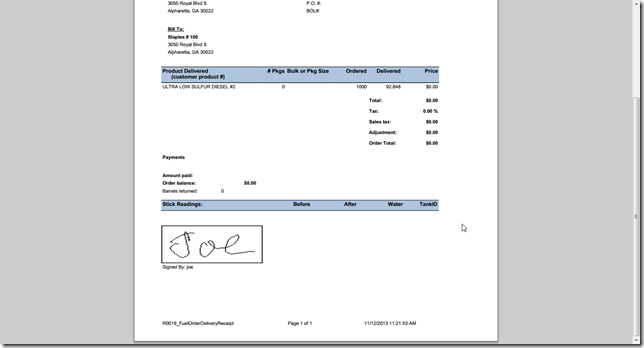 BizSpeed’s Proof of Delivery (POD) and unit filling customers (on-site mobile fueling, on-site fleet fueling, and metered lubricants and bulk products) can offer the portal to their customers. 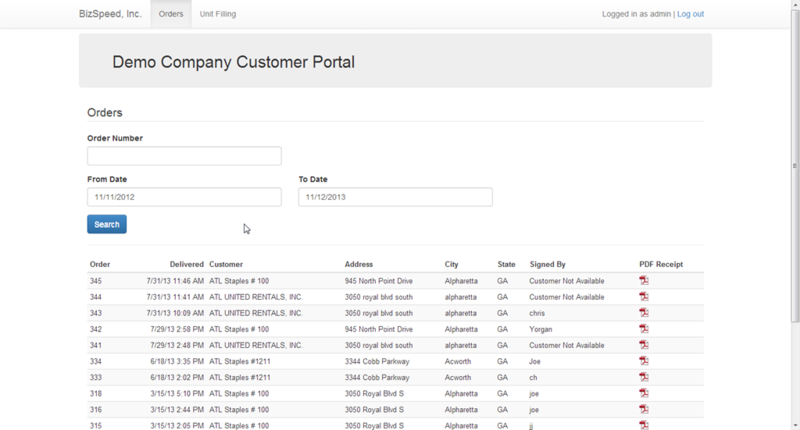 After logging in, your customers will see the default view to search for orders delivered in the previous week. 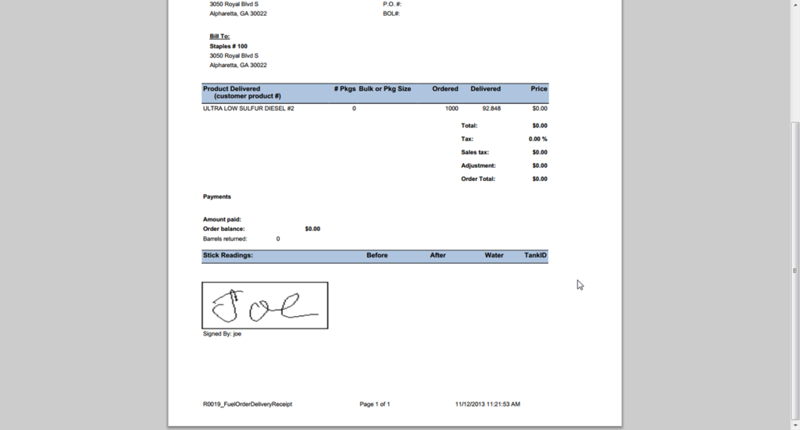 They can search by customer order number or by date, and view your specific delivery receipt as a PDF. 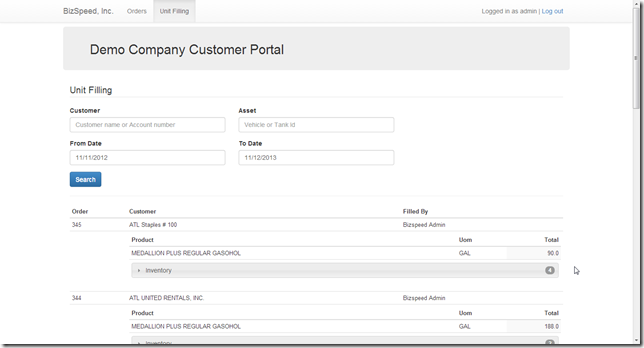 Unit filling customers can search by customer location, asset or date range. 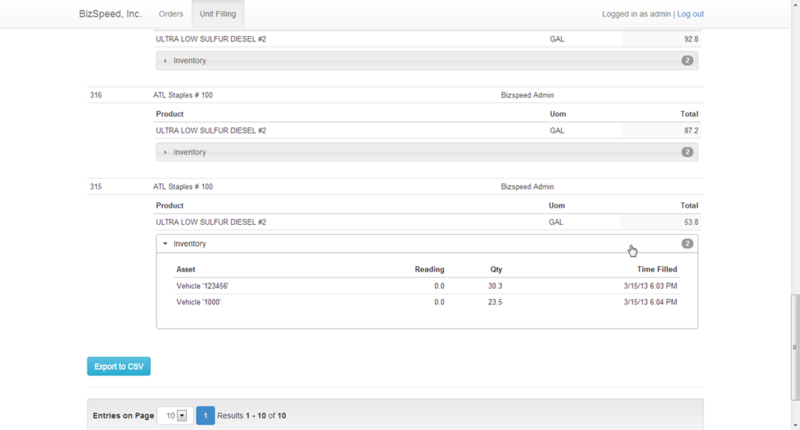 The list filters to show all deliveries associated their account and search criteria. 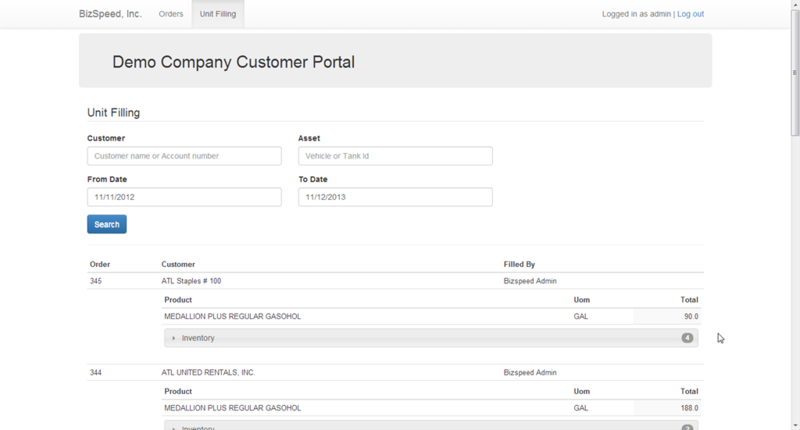 The application uses expanding controls so you can see by line item how many assets have been filled, and then can expand to see the individual asset list, time it was serviced and the reading. The reading is the odometer for vehicles. 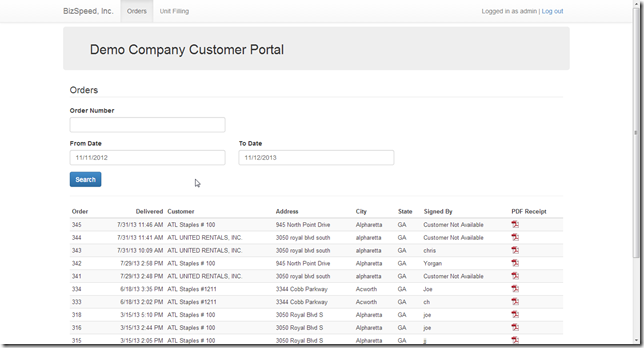 Customers can ‘export to CSV’, to view all their data in Excel. 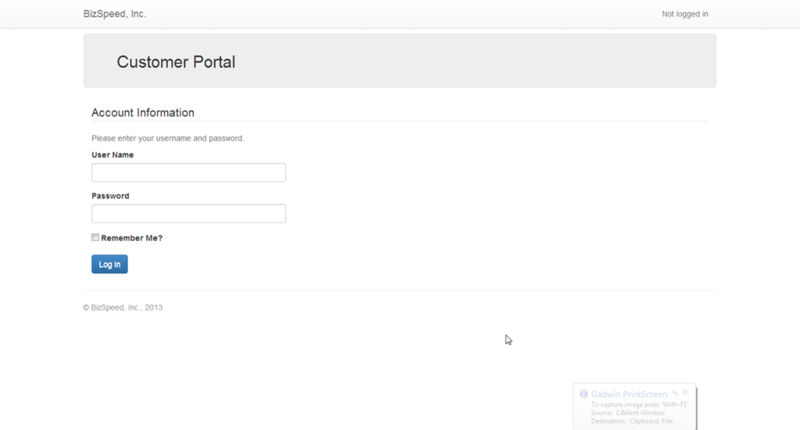 The customer portal is available as an option for our hosted customers as well as those installed on-site. 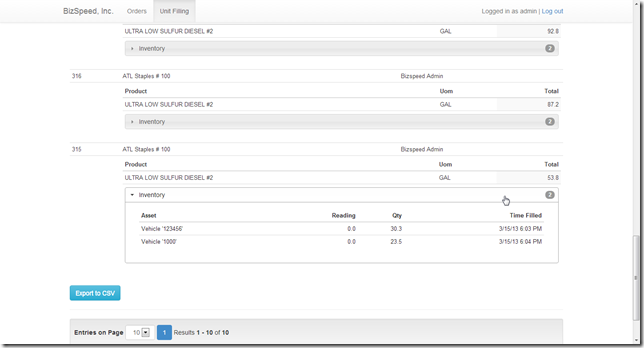 At the request of our lubes distributor customers, we have added LoadBuilding into our dispatch capability for the MobileHub. 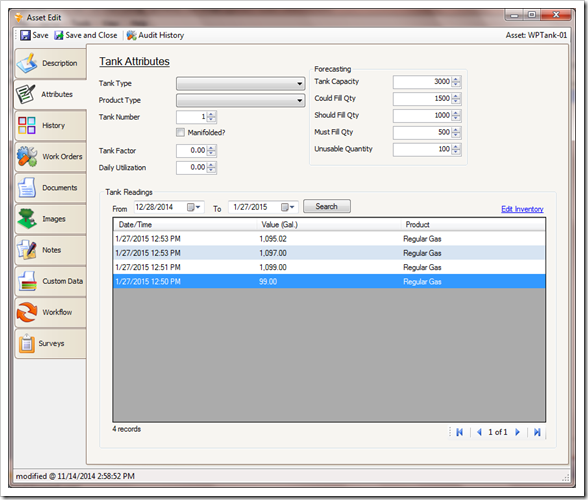 LoadBuilding enables a dispatcher to create a trip and drag orders onto the trip. As orders are added to the trip, a window shows the total quantity on the trip for each product, across all orders. Multiple trips can be added to the view so orders can easily be dragged between trips to quickly see the impact of the load on each trip (route). 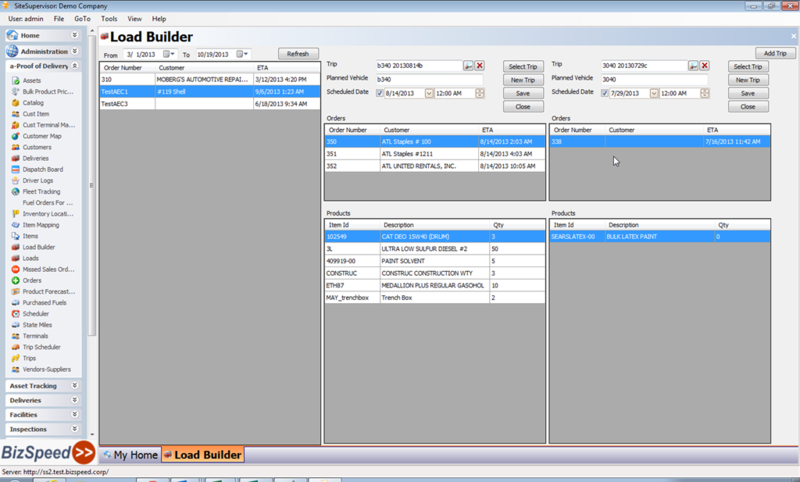 Loadbuilding is used by companies that do not have route optimization systems like Ortec OTD or RedPrairie’s TMS. Those systems take a set of orders and automatically build routes, with each route having a set of orders that are within the constraints of each vehicle. Companies who have just a few vehicles at each depot have dispatchers who know what the vehicle capacity constraints are. For example, a lubes dispatcher may know their combo trucks can have 1 – 10 totes of 500 gallons each. They want to build a trip and as they drag orders onto the trip, see the total of each product. In this case, they have 3 orders with 200, 250 and 100 gallons of 5w-20 oil. The dispatcher would easily see the total is 550 gals, which is more than one tote. They could decide to add more orders to fill 2 totes, or see if they can add the 100 gal order to a different trip. Load building can be used by package delivery companies as well, as they will see the total by product on each trip. 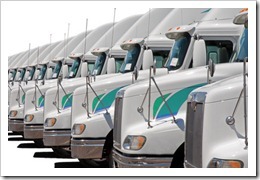 Do you know who your best on-site fleet fueling drivers are? Do you know based on actual metrics, or based on gut feeling? 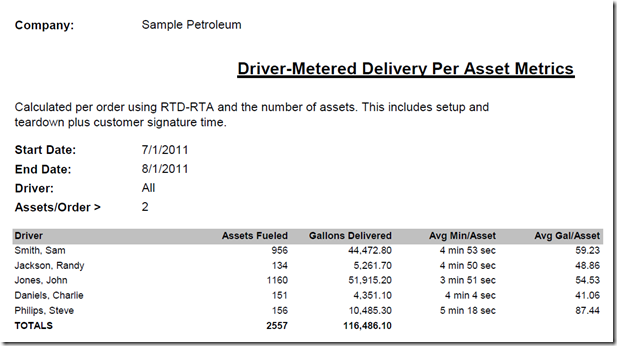 BizSpeed’s goRoam for Metered Delivery automatically collects metrics such as when the driver started a delivery, when they stopped and gallons pumped through bulk meters. Our customers have access to metric reports and can schedule them to be emailed daily, weekly or monthly so you get direct visibility into your drivers. 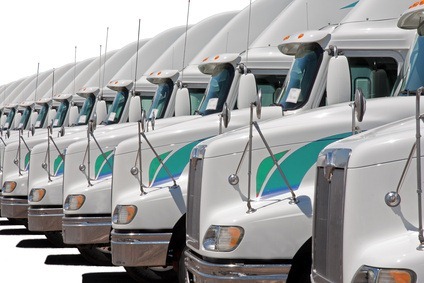 The ability to operate your fleet fueling, bulk lubricants or wet hosing business based on facts and metrics is what enables you to drive operational efficiency. These metrics are available in real-time, without the need to ask someone to collect, input and analyze data. As you can see from the report shown above, John Jones makes the most deliveries and is also the most efficient. He delivers more fuel than average but is a minute per vehicle more efficient. Steve Philips is also efficient. While his delivery times are longer, he delivers 80% more per vehicle than the average. 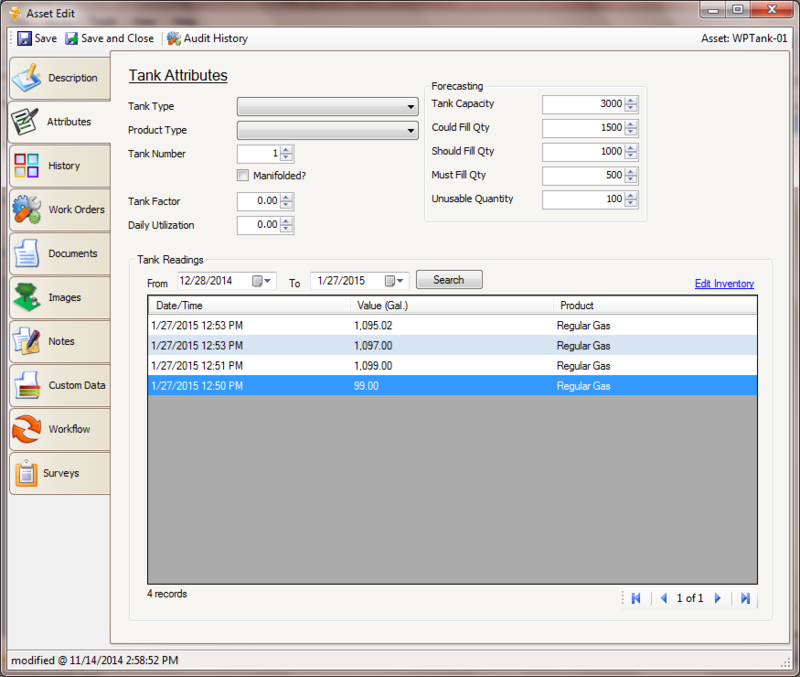 We can show average time and gallons including setup, customer signature, etc. as well as without the setup. If you’d like to see how we can help you automate your metered and non-metered deliveries, please contact us. Intermec just announced they are acquiring Vocollect. Vocollect is one of the leading voice picking vendors. Voice picking has been heavily used in warehouses to enable warehouse personnel to use a headset and voice commands to get pick and put-away products. Click here for the press release. Over the years, we’ve worked with a number of voice picking companies. None have been able to make many inroads outside the four walls because the voice apps are typically using wifi to ‘talk to the server’. In the field, you frequently have disconnected users with no cell or data connection. The voice enabled apps are good because it allows warehouse personnel to use both hands, and definitely can speed up operations. It also enables multiple languages and works in loud environments. 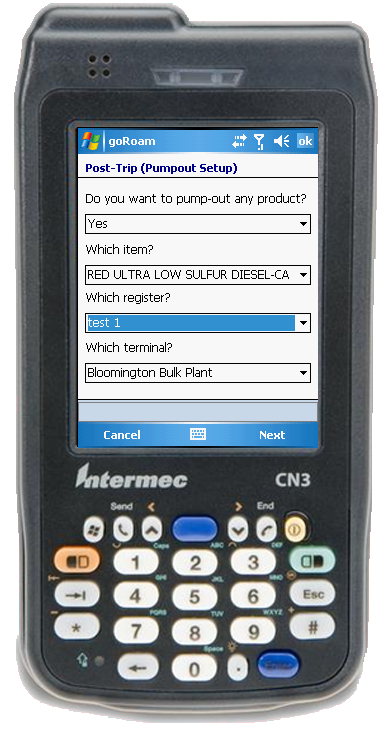 Typically Intermec and Motorola have not entered the application software space. 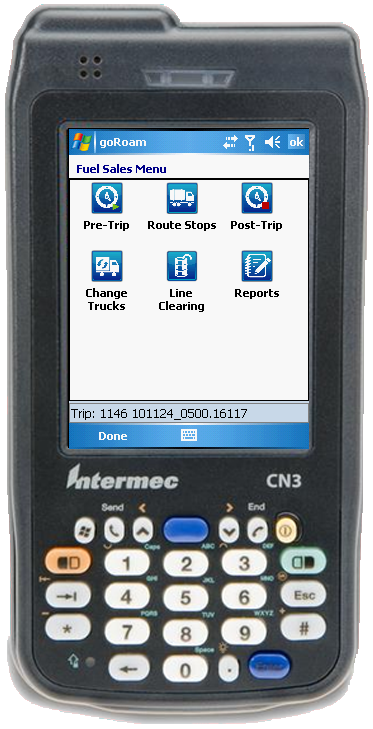 It will be interesting to see how this affects Intermec partners. 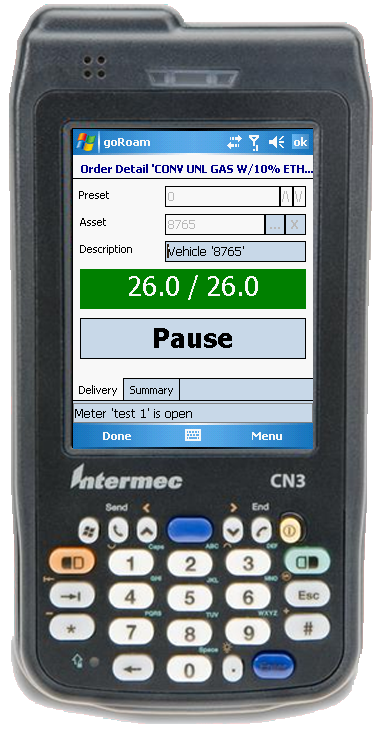 From a reseller perspective, this should be good if Intermec resellers can promote the Vocollect solution. 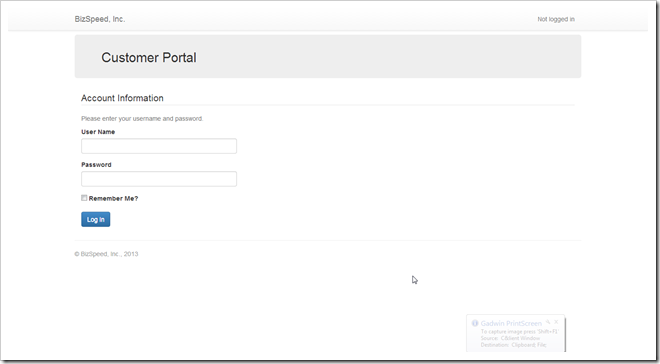 From an ISV standpoint, it is not good if you are a voice-enabled ISV (which we are not). Those voice ISV’s will look to strengthen Motorola, LXE and other hardware vendor relationships. Let us know your thoughts or questions in the comments section. Microsoft announced the release of Windows Embedded v6.5. 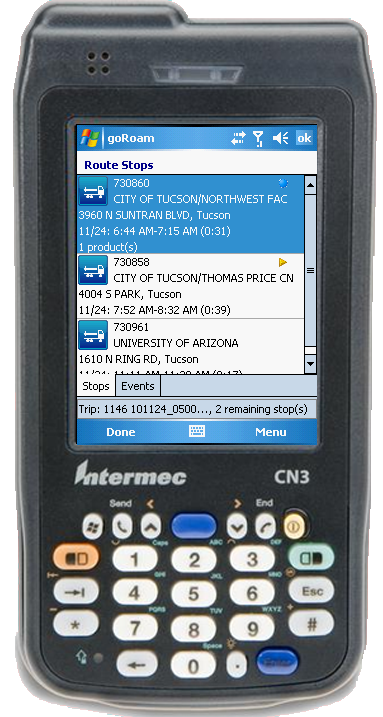 This is the core Operating System (OS) that rugged Windows Mobile devices from Motorola and Intermec will use. It is based on WinMo 6.5. The most important part of the announcement is that mainstream support will continue through 2014 and extended support will be available through 2019.